Step inside the Sistine Chapel and feast your eyes on the most famous frescoes ever painted. You'll soon understand why so many consider Michelangelo to be an artist without peer. This was the only negative of the trip. This was the only negative of the trip. The guides were excellent in keeping us together, but the massive crowds in the Papal Art Galleries and Sistine Chapel resulted in us not being able to stop at any point to view any of the art. Very crowded with long lines. Crowded, jostled, not enjoyable, literally hundreds of people passing you the entire time. Crowded, jostled, not enjoyable, literally hundreds of people passing you the entire time. Guards at microphones screaming "silencio" every minute or so. The tapestries and pictures were so well done and tells the story of Christ so well. The tapestries and pictures were so well done and tells the story of Christ so well. We were in awe of the beauty. Definitely go early for the best viewing. Nice to see at least once. Nice to see at least once. We had “skip the line” tickets, which is a must in the summer time. When we finally negotiated the Vatican Museums [not very interesting and crowded] I was underwhelmed at the Sistine Chapel. I&apos;d expected a large room with a painted dome. Bypassed huge crowds so we saw it before most people- just gorgeous!! 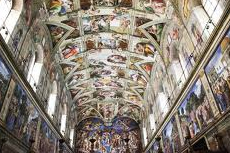 When in Rome Tours - Admission to Vatican Museum and tour including Sistine Chapel. When in Rome Tours - Admission to Vatican Museum and tour including Sistine Chapel. Excellent - No waiting and a good guide. Great tour, but obscenely expensive. Great tour, but obscenely expensive. About $800 for two people. Tour lasted about an hour. Worth going, but not for this price. Was not for the older generation and those with slight medical problems. Was not for the older generation and those with slight medical problems. Maybe if Pope would have come out to bless us it might have worked. Wall to wall people - look up but NO pictures and NO talking. Wall to wall people - look up but NO pictures and NO talking. I was saddened and disappointed to see how many people try to take pictures and insist on talking which ruins the experience for everyone else. We saw all the major sights from the bus. Took with the Vatican Museum tour. Took with the Vatican Museum tour. Another humbling experience. Much too crowded to enjoy and appreciate this marvelous work of art. Much too crowded to enjoy and appreciate this marvelous work of art. Our guide sat us in the gardens, pulled out a poster for us to look at as she explained everything contained in the Chapel. Quite a long walk before you get to the actual Sistene Chapel but lots to see on the way. Fabulous experience. The ancient maps and tapestries were amazing. I loved the freaky optical illusions (Jesus&apos;s eyes following one, table repositioning itself), woven into some of the tapestries. Independent tour a must to get as much out of it as possible in the most efficient amount of time- Scarves are sold on street by vendors for 2 euros if you forgot a shoulder and knee cover up. Amazing, the paintings look 3D and to think of What a genius Michael Angelo was and the beauty that he created. We saw "Moses", the Roman Forum, the Coliseum, the Vatican Museum and we walked through the Sistine Chapel. After exiting the chapel we entered Saint Peter&apos;s Bascillica and saw the "Peita". Awesome! Great tour that packed a lot in. Great tour that packed a lot in. Sistine Chapel, St. Peter&apos;s and Rome in general were insanely crowded, but we were able to see much more on the tour than we could have on our own.